In the example above you see that two invoices were generated on November 5th. However, the start date for the recurring invoices in July 5th and there wasn't an invoice generated on that date. 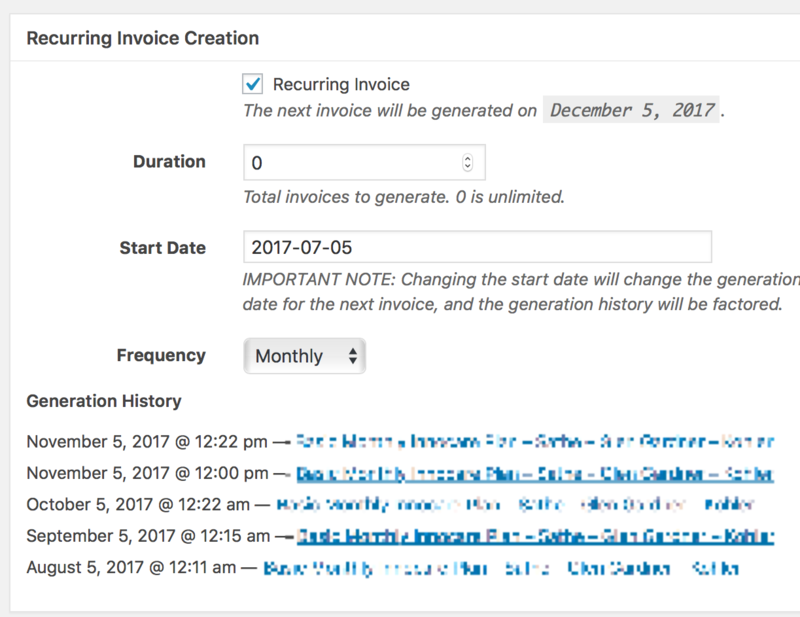 The result: the first invoice generated on November 5th was to reconcile the missing invoice for July 5th (since one wasn't generated on the start date). Void one of the newly generated invoices. Do not delete the invoice, unless you adjust the start date (in this example, it should be reset to 2017-08-05). Otherwise Sprout Invoices will determine there's a missing invoice again. Confirm the next generation date is accurate. If it is not please contact support with a screenshot of your recurring invoice configuration. You will may need to process some refunds if both invoices received automatic payments on the generation date. Void one of the invoices (same as above). Manually void the payment associated with the voided invoice. Manually process a refund at your payment processor. If you need a script to help you with handling generated invoices that were auto-billed I created a script that can help. You may want to contact support for help before using it.